The village of New Clipstone did not exist before the First World War. 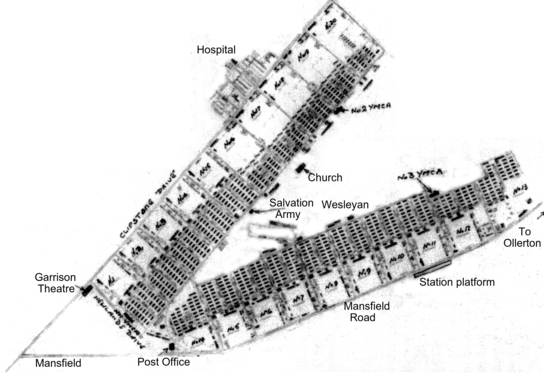 At the outbreak of war a large army camp was set up between Clipstone Drive and Mansfield Road. 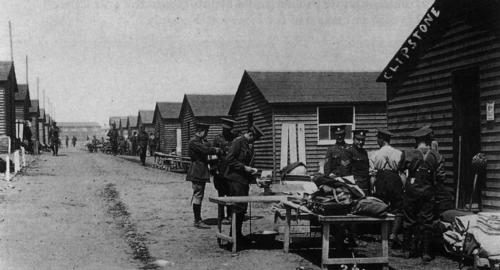 The camp quickly became one of the largest in the country, housing 20 battalions of 1000 men each. The first troops arrived in 1915 having marched from Mansfield or Edwinstowe after arriving by train. Five battalions of Royal Fusiliers made up the first contingent. They helped to set up the camp and established firing ranges and trenches. Clipstone Heath was used as the training ground. 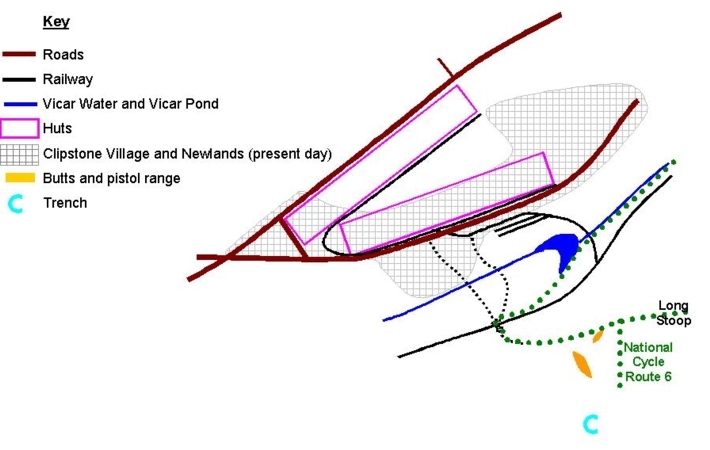 Rifle and pistol ranges were constructed near the camp to the south of Vicar Pond. A large network of trenches, straight, curved, right-angled and zig-zag, were dug across the heath as far as Oak tree Lane in Mansfield. Some of these can still be seen in Sherwood Pines. Other battalions followed, including a footballer’s battalion from Middlesex. Mansfield Town Football Club finished top of the league in 1915 thanks to the help of these talented soldiers. The Manchester circular trench marked on the map. The Camp was closed in 1920 and a lot of the huts were sold off. The village of New Clipstone stands on most of the site. There are still remains of some of the extensive training trenches on the very western edge of Sherwood Pines. Orginally they stretched right across the heath towards Rufford. 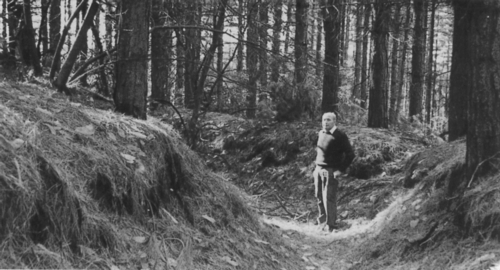 During the Second World War a practice bombing range was set up in the forest. Small bombs were dropped aimed at a 20 ft square block of concrete. It didn’t always go according to plan, as Mr Aincliffe, a tenant in the Forestry Commission homes in Deerdale about half a mile from the target, found out when a bomb crashed through the roof and ended up on his bed. Sherwood Pines has a resident population of fallow deer thanks to another wartime accident when a tank knocked down an electric fence keeping the deer in Rufford Park.